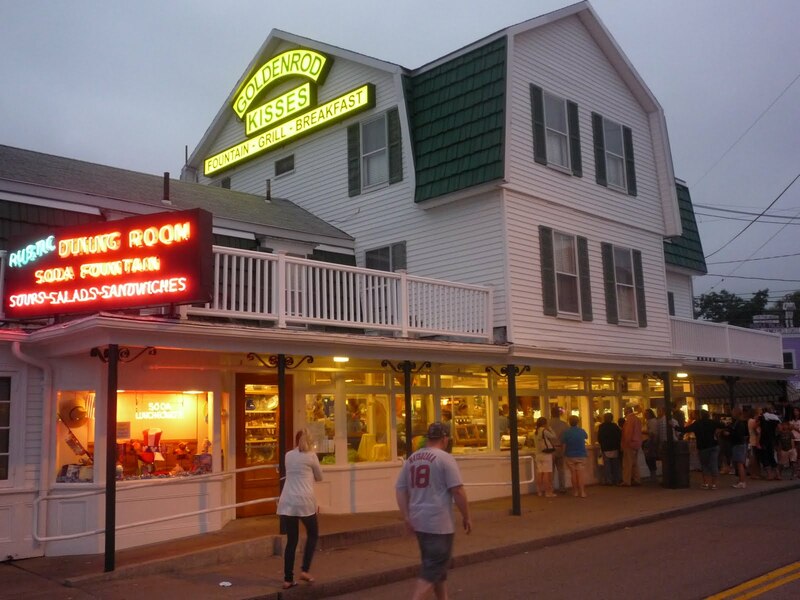 You know summer is on the way when The Goldenrod in York Beach, Maine, reopens for the season for all that wonderful salt water taffy. This beloved restaurant, candy and gift store, and ice cream shop has been around since 1896 and is best known for its “Goldenrod Kisses” salt water taffy which is made on the premises. 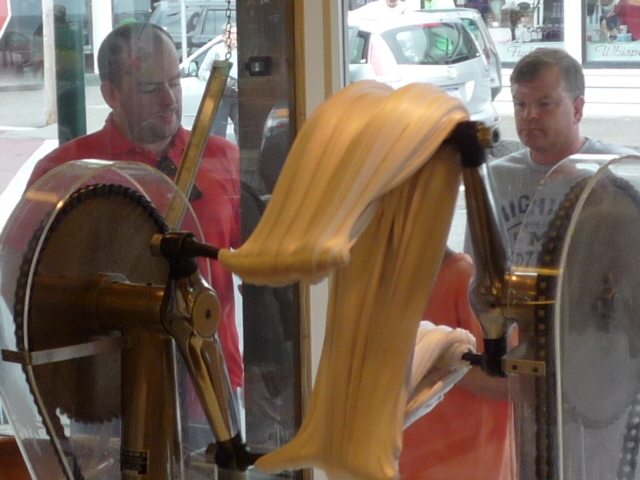 What a classic summer scene with so many vacationers gathering outside to watch the taffy-making process through the window! It’s an equally classic summer scene seeing so many people walking around York Beach with boxes of Goldenrod Kisses. We know very few people who leave York Beach without purchasing some taffy from The Goldenrod. 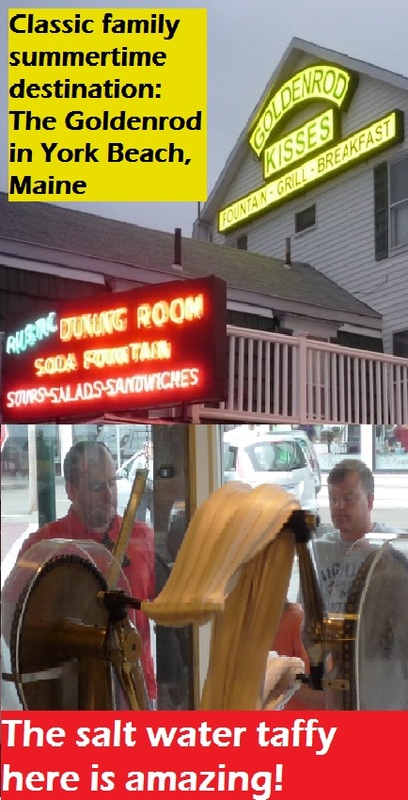 Inside, the sweet aroma of molasses and boiling sugar from the taffy-making and the heartwarming sight of the authentic soda fountain counter and rustic dining room (breakfast, lunch and dinner served here) never fails to welcome repeat and new visitors to this truly wonderful summer tradition at York Beach. From banana splits and homemade fudge to delicious New England clam chowder and lobster rolls, it looks like a smiley face convention amongst customers no matter where you look at the Goldenrod! To make the whole experience that much better, The Goldenrod has a central downtown York Beach location across the street from Short Sands Beach, and near many stores, as well as York Wild Kingdom Zoo and Fun Park — a terrific zoo and amusement park. The Goldenrod not only serves as a nice York Beach tradition, but also a great cheap travel destination. As an example, buying a box of taffy and enjoying a reasonably priced comfort food-style meal and ice cream will certainly not break the bank here. Hope you get to visit The Goldenrod, it’s a true rite of passage into a York Beach summer! For more info on the York Beach area, we suggest reading our “York Beach Vacation Review” and“Ten Reasons to Visit York Beach, Maine” articles. Please share The Goldenrod graphic below on Pinterest. Thanks!